Liquid metal for Terminator robots; thermoelectric alloys; more GaN. 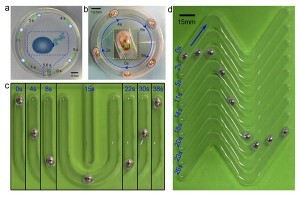 The Chinese Academy of Sciences and Tsinghua University have devised a robot-like, self-fueled liquid metal mollusk. The liquid metal alloy within the system can move by itself and change form like the shape-shifting T-1000 robot in the movie Terminator 2: Judgment Day. The system consists of a liquid metal motor. The liquid metal is a mix of gallium, indium and tin. It stays liquid at temperatures above -19 degrees Celsius. An integrated power source within the motor uses aluminum as a fuel. The aluminum reacts with sodium hydroxide to release hydrogen gas. This also releases a charge, causing the liquid metal to move. The system can move itself in a circle, straight line, or even squeeze through complex shapes. A drop of liquid metal has enough power to move around for up to an hour. The technology is still in R&D. Self-healing metals could be used in civilian and military applications. A self-fueled pump is one practical application. The Institute for Basic Science (IBS) and others have devised a new thermoelectric alloy material that is nearly twice as efficient as existing technologies. Samsung Advanced Institute of Technology, Kangwon National University, Sungkyunkwan University and the California Institute of Technology also participated in the work. The alloy from researchers is aimed for solid-state devices. Thermoelectric alloys, which have high melting points, are devised through a process called sintering. This process compacts and forms a solid mass of material by heat and/or pressure. Researchers from IBS and others used a process called liquid-flow assisted sintering. In the process, they combined all three antimony, bismuth and telluride granules into one alloy (Bi0.5Sb1.5Te3). Additional melted tellurium was used as the liquid between the granules to help fuse them into a solid alloy. Traditionally, sintered Bi0.5Sb1.5Te3 has thick and coarse grain boundaries. This, in turn, has led to a decrease in both thermal and electrical conductivity. The new liquid-phase sintering creates different grain boundaries. They are organized and aligned in what researchers called a dislocation array, which, in turn, reduces the thermal conduction. The next-generation power electronics market continues to heat up. Tyndall National Institute has partnered with U.S. and Northern Irish research institutes to secure €1 million in funding for a project that will develop a next-generation gallium-nitride (GaN) technology. The effort, dubbed the Nano-GaN Power Electronic Devices project, will seek to improve the efficiency of converting electrical power by up to 25%. Others are also working on next-generation GaN. This includes the Advanced Research Projects Agency-Energy (ARPA-E), part of the U.S. Department of Energy. The program is developing GaN-on-GaN and other technologies. GaN has been touted as the next big thing in power and RF. GaN has a bandgap of 3.4 eV. Today’s GaN-on-silicon devices are lateral structures, meaning the current flows from the source to the drain on the surface. GaN-on-silicon devices suffer from various issues. In fact, lateral GaN-on-silicon devices could hit the wall at 600 volts, prompting the need for a next-generation technology, namely bulk vertical GaN transistors. In vertical GaN devices, the electrons flow from the top to the bottom.